MILAVIA > Forum > Military Aviation > Air Forces > Who is the top scoring jet ace in history? Who is the top scoring jet ace in history? 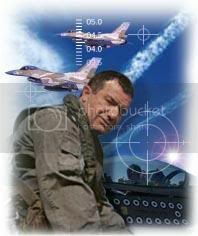 Colonel Giora "Hawkeye" Epstein (Hebrew: born 1938), today Giora Even is a retired colonel in the Israeli Air Force (IAF) believed to have shot down more jet aircraft than any other pilot. Epstein was credited with 17 kills, all against Egyptian aircraft. With seventeen confirmed kills, Giora Epstein is also the "ace of aces" of the Israeli Air Force. Epstein was an active IAF pilot from 1963 until 1997, when he retired at age 59. He, like many retired IAF fliers, is currently a captain for El-Al airlines. Epstein joined the Israeli Defense Force (IDF) in 1956 during the Suez War. He was initially rejected from flight school because of a heart condition and thus began his military career as a paratrooper. While traveling with the IDF's parachute demonstration team, Epstein changed his last name to Even ("stone" in Hebrew). He left the IDF in 1959 before returning two years later to again apply for flight school. After gaining medical clearance (mostly through his own stubbornness), Epstein began fighter training. He soon gained the nickname "Hawkeye" due to his extraordinary eyesight. Epstein was allegedly able to spot aircraft from twenty four miles away - nearly three times the range of the normal pilot. Epstein's first kill came on June 6, 1967 (during the Six Day War), when he downed an Egyptian Sukhoi-7 at El Arish. During the War of Attrition in 1969-1970, Epstein downed a MiG-17, another Sukhoi-7 and two MiG 21s. The rest of his kills came during 1973's Yom Kippur War. Over the course of three days (October 18-20, 1973), he downed an Mi-8 helicopter and eight jets: two Sukhoi-7s, two Sukhoi-20s and four MiG 21s. Then, on October 24, 1973, Epstein downed three more MiG-21s west of the Great Bitter Lake. Eight of these victories came with Epstein at the controls of the French-built Mirage III, a delta wing fighter designed primarily as a high altitude interceptor. His other nine victories came in an IAI Nesher, an Israeli-built version of the Mirage V.
Re: Who is the top scoring jet ace in history? In fact this post is about jet aircraft that shot down only other jet aircraft. Several unsubstanciated claims were made by the Luftwaffe in regard to Me-262 pilots shooting down propeller driven planes to rack up the biggest score. 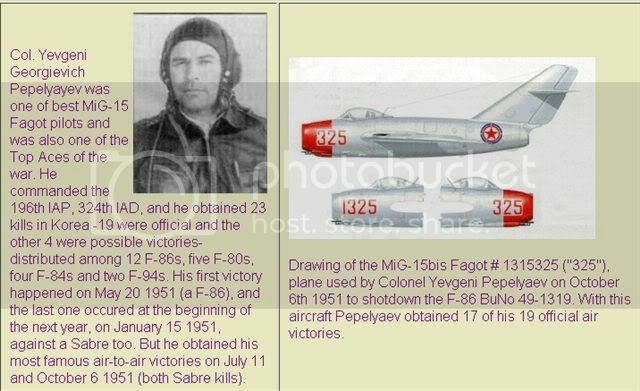 What about MiG-15 pilot Captain Yevgeny G. Pepelyayev of the VVS? I believe he was credited with 19 kills during the Korean war. I'd never heard of him to tell the truth and you should have put it up as your own post Biggy. Here is some information I found. It appears to be true as I can't see any contrary USAF claims. Much of the information about Soviet pilots who fought for the North Koreans during the war remains fragmented. Its accuracy is subject to debate, and much of it isn't readily available. I've stumbled across bits and pieces here and there, but it really hasn't been that long since the Russians finally openly admitted the extent of their involvement. They said nothing for over 40 years. Nevertheless, there were obviously some exceptional Russian "Honchos" that fought for the North, that much is certainly clear- a fascinating chapter in the history of military aviation. I didn't see the need to start a new thread. You posted a question and I tried to answer it. The top scoring jet ace, was Kurt Welter. He flew a Me-262 nightfighter, from end of 1944-45. He shot down 68 enemy aircraft (confirmed) yet his score maybe maybe higher. He is credited with 29 kills flying the Me-262 nightfighter, but this is a very lowball figure. Most of his victims were Mosquito Intruders. Also Erich Rudorffer(222 victories) may have exceeded Heinz Bar (220) +16 in Me-262. Imagine, if they had flown the Gotha flying wing fighter....in testing the prototype was far superior too the Me-262!!!! Nice list of Me262 aces there. But as already said before, those weren't against other jets though, probably a lot of bombers too considering the timeframe Still respectable though! I agree, that these aces flew jets vs piston powered planes. But one must consider that the allies had complete air superiority by the time the Me-262 appeared in the skies over Europe. Most times it was 15-20 jets vs 400 B-17s escorted by 600 Thunderbolts and P-51s. Then, we had fuel shortages, lack of good landing sites(they even used the autobahn) and the danger of being vulnerable when landing the jet for rearming, refueling.